So you’re looking to take your gains to the next level. Like its namesake, a power rack builds power. Extreme power. There are reasons why the power rack is the proverbial gladiatorial pit which builds strength amongst the worthy. And we will learn more about them as the article progresses. Half-Rack Vs Power Rack – What Do You Need? The Rogue Monster Lite RML-690-C combines the features of the Rogue R6 Power rack and the RM-6 Monster Rack. The Rogue Monster Lite series is more advanced than the Infinity series but is not as solidly built as the Monster series. It is a better option for serious weightlifters as it offers excellent support when lifting heavy weights. Rogue Monster Lite power rack weighs 530 pounds and comes in a range of colors with a semi-gloss finish. It features handy attachments such as bumper bar storage posts, Monster Lite j-cups, and pipe safeties. It’s so sturdy that you don’t even need to bolt it to the floor, a bonus for many people. The Rogue Monster Lite RML-490C is a highly versatile option for serious home gym enthusiasts. It is a robust piece of equipment that comes with a whole range of accessories. 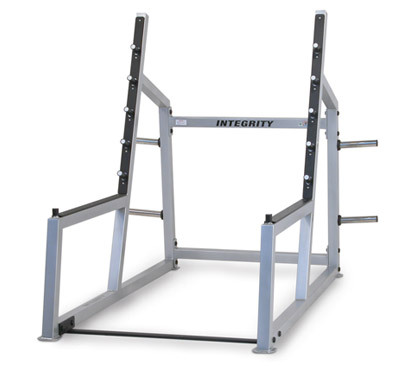 It has a 3” by 3” 11-gauge steel upright framing, taking inspiration from the Rogue R-4 power rack. 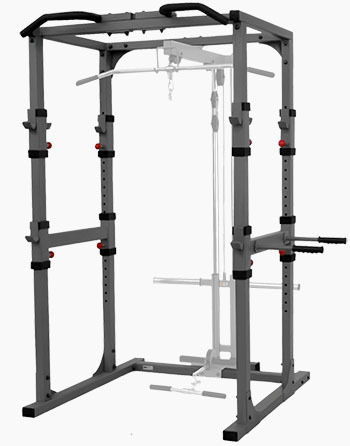 This is a popular model for garage gyms, although it is used in professional strength training facilities as well. Since the uprights of this power rack are 90 inches tall, you get more than enough height to perform overhead pressing movements. It is manufactured in the US and is a great device for anyone serious about pumping iron. Also comes in 10 distinct Rogue powder coats, check them out here. 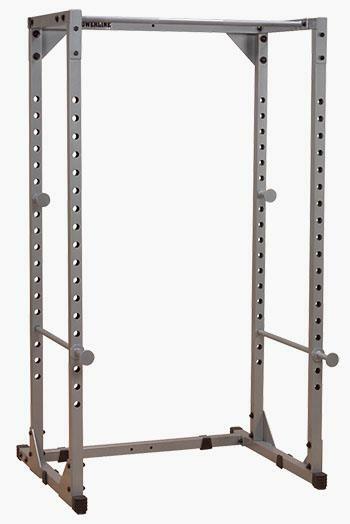 RML-390F Flat Foot Monster Lite Rack piece of equipment is the Flat Foot version of the RML-3 Monster Lite Power Rack. 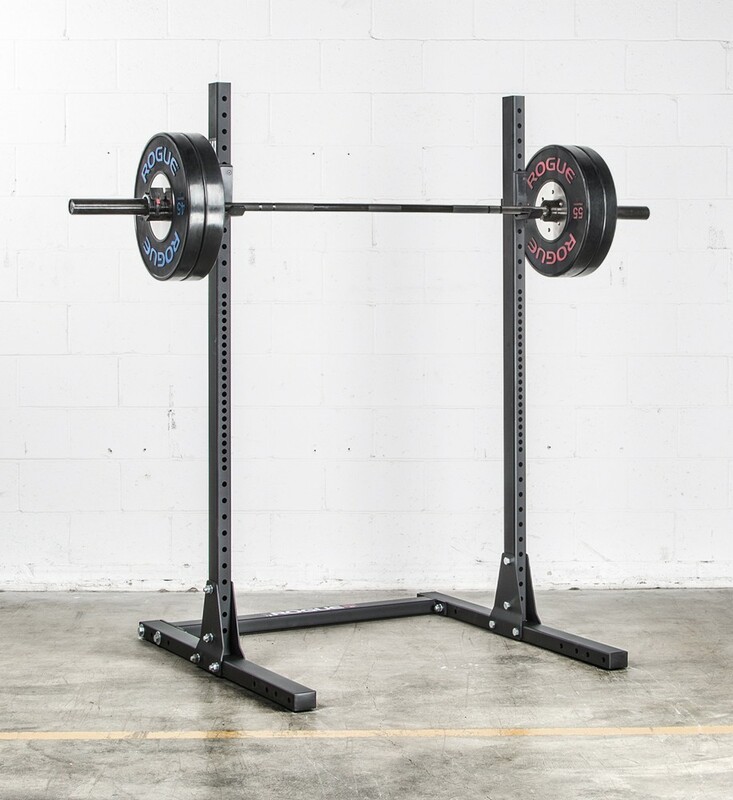 A major benefit of this power rack is that it comes with a self-stabilizing base. This means that it doesn’t need to be bolted to the ground and can be shifted if necessary. It provides major flexibility in a home gym as it takes up a space of only 48” by 49”, while still having an inside depth of 30”. It comes with a pipe safety system and a pair of Monster Lite J-Cups. 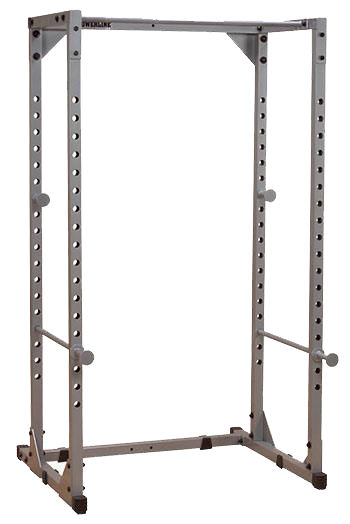 Customers can also customize their racks by choosing between a Fat/Skinny 43” or Single Skinny Pull-up Bar. If you already own a Rogue SML-2 or SML-3 Squat Stand, you should check out the RML-390F conversion kit available now. The Rogue RML-3W Fold Back Wall Mount Rack comes with a unique hinge and pin system, giving you the freedom to quickly remove the pull-up bar once you’re done with your workout. It features two 3” by 3” 11-gauge steel uprights and 2” on centre spacing both above and below. The side of this rack can be folded back against the fall to free up an enormous amount of space. Depending on your needs you can choose from 2 depths—21.5” and 41.5” – you can check on their website. The biggest advantage of the fold-back wall mounted rack is that it takes up less than 5” space from the wall when stowed away, making this an ideal option for anyone with space constraints. This power rack would be great for home gym owners. It had several added accessories and space to add many more. This version has most of the features of the R-4 albeit in a smaller package – Rogue R-3 has been the staple of many home gyms the world over. 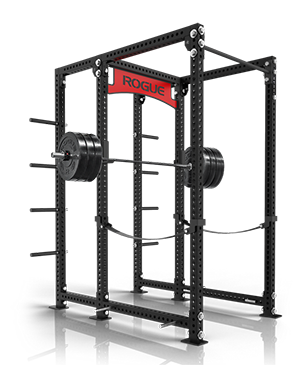 Find our Rogue R-3 Power Rack review here. 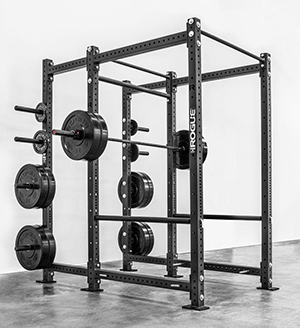 The Rogue R-4 Power rack has several marked improvements over the earlier R-3. This model too has been seen in all types of gyms over the years. 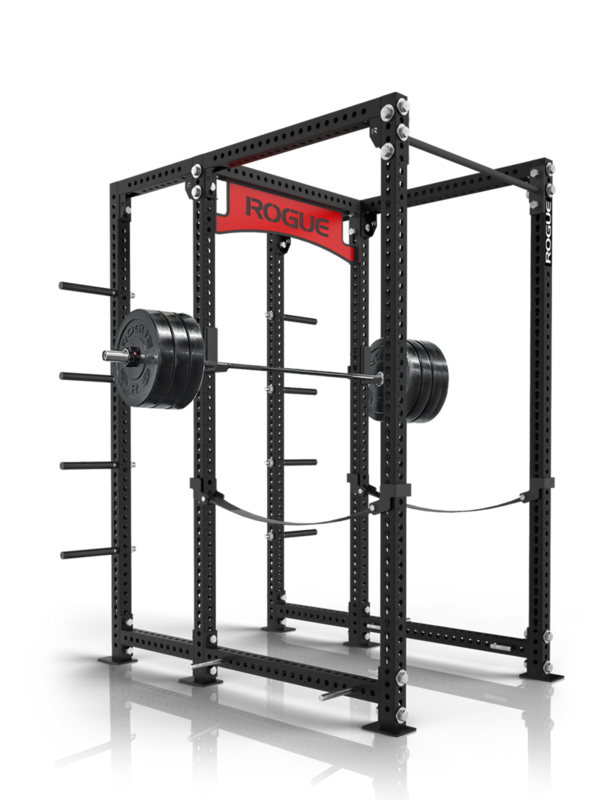 Find our Rogue R-4 Power Rack review here. 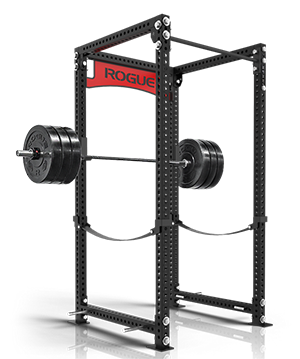 Highly customizable, reliable and durable the Rogue R-6 Power Rack was a very efficient unit which you could modify to meet your needs. 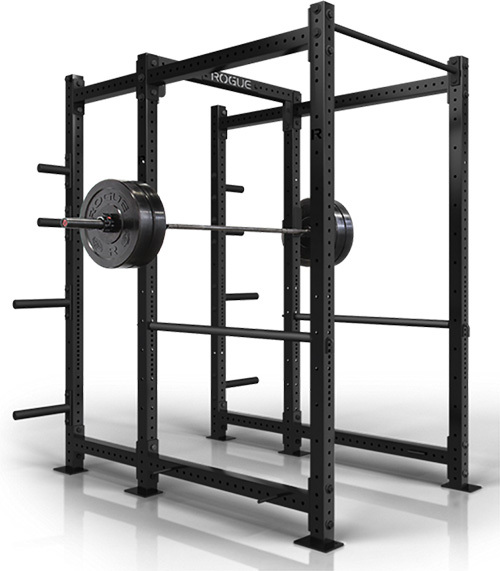 Find our Rogue R-6 Power Rack review here. First in the line of monster series, the Rogue RM-4 introduced 3X3” tubing in place of the older 2X2s. Rogue also lets you choose a custom powder coat for your power rack. Find our Rogue RM-4 Monster Rack 2.0 review here. Carrying over from the earlier models, Rogue RM-6 is one of the most durable and well-equipped models out right now when it comes to power racks. Find our Rogue RM-6 Monster Rack 2.0 review here. Rogue RML-690, like other Rogue 6-series products offers uncompromising build quality and craftsmanship to take on the heaviest loads and abuse. 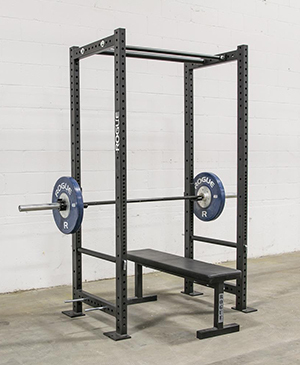 Find our RML-690 Power Rack review here. Rogue RML-3WC is definitely your got to option when you have limited space but want to make the most of it. Find our Rogue RML-3WC Fold Back Wall Mount Rack review here. These are plenty of good reasons to opt for a power rack, right? While it might be a tad expensive to get good ones and it might take up a more than a bit of space, a squat cage can be the ultimate tool for building strength and is incredibly versatile. You can use it for building explosive power, endurance, CrossFit or strength training with minimal changes to your equipment. Needless to say, you will lose fat with a power rack – a lot of it. Compound exercises are one of the best ways to lose unwanted flab, get trim and firm. Your “bench” is a question that arises in many fitness circles. Your bench strength is a good indication of your overall upper body strength. When you have a power rack at your disposal your bench strength increases quite a bit (provided you use it right). Make no mistake; there are many things that are in favor of a power rack. A power rack is a necessity for proper strength building but there are some factors that might hinder you from considering it for your home gym. Here are a few things that can be problematic for you. Space: A power rack is a fairly big and unwieldy piece of gym equipment that can be daunting for people with smaller rooms. You need to make sure that space isn’t a premium when you set one up for your home. The thing with power racks is that they grow along with your needs and soon you might find yourself unable to add more accessories beyond a certain point. Case in point: chin-up and pull-up bars. Additional Accessories: A power rack is only the frame and probably bars and safety pins. But you need to purchase the rest of them and most people do not factor this into their expenses. Stuff like barbells and weights are going to cost you extra and if you're a heavy lifter, will probably run into a sizeable sum. Just buying a power rack will probably not help you build your muscles; you need weights and other accessories to make it work. There are many people who are believers in free weights. I too believe in the philosophy that when you move weights around without it being attached to wires or pulleys, it can build a stronger body. 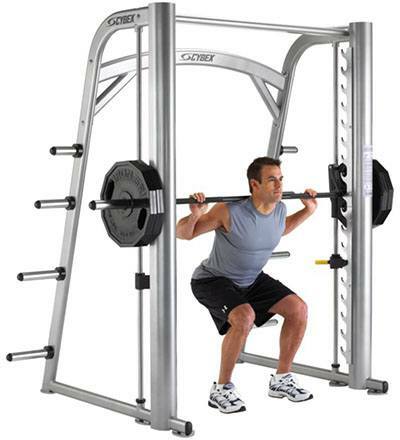 Power racks enable you to get into the regime of weightlifting in a safe environment and they allow you a multitude of exercises to get stronger. Using weights that are not tethered encourages your body to use the stabilizer muscles which give you more strength and fitness overall. So stick to power racks and become stronger than ever before! Customizable With Built In Safety: Most power racks out there will have safety pins on either side of the cage which you can set to your specific requirements. They stop the downward movement of a loaded barbell and prevent injuries during untoward circumstances. Let’s say you accidentally lose grip on the bar during an extremely heavy squat session, the safety pins will save you from an impact. Talking about squats, it is an essential tool for building overall strength and muscle mass. Without a power rack, it’s literally impossible to get the bar in position even if you are experienced. It prevents a lot of injuries and gives you the perfect platform to perform exercises without any problems. High Flexibility And Versatility: Most people think that a power rack is only useful in case of certain exercise; I have found that it is not true at all. I’ve seen my experienced friends even use it to enhance Crossfit training. Even when engaged in power exercises you can bench, squat, dips, chin-ups and a whole lot of other exercises to build strength. If you just want to get to the meat and potatoes, I’ve outlined a few of them I think can give you the max value based on popular choices like function, price etc. I suggest if you are in need to make an informed choice to go through the full article as your needs may vary and might not match with what we have highlighted here. One of the best power racks that we have tested; this is built solid to last you a long time. It is built comfortably large, and has dimensions of 44W X 82H X 46D. 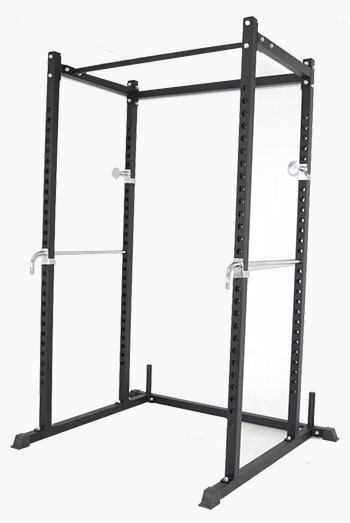 This means that you can accommodate people of varying physique in this and you don’t have to buy different power racks for your garage gym. Like with all power racks in this price range, you can use this as a multi-purpose all in one machine with which you can do squats, inclined presses, and also a flat bench. This is a complete workstation right at your home. It is backed up by a 10 year frame warranty which speaks volumes about its reliability. Since it is built wide enough, lifters have ample room to move around and from side to side. When it comes to safety, it has 2 heat-tempered liftoffs along with saber style safety rods to ensure that your exercise routine is not just effective but safe as well. Click here to read our review of the "PowerLine PPR200X Power Cage". If you are looking for a power rack that ticks all the boxes including the value, then you might be hard-pressed to find anything better than an XMark XM-7620. I’m inclined to think that this is pretty much going to be the standard to beat for all other power racks out there. 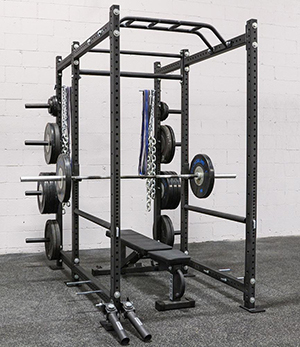 Xmark have made this power rack with the best interests of lifters in mind. 11-gauge steel, 4 pairs of U-shaped bar catches (one back-inside, two front, one front-inside) complete a total package. It comes with 24 adjustment holes for people heights ranging from 5 to 6 feet 11 inches which translates into flexibility for a lot of people. It should be more than enough for a home gym for about 99% of the population. This has pretty much won me over and I find myself recommending it to first-time beginners and people who are experienced but not experts. Most manufacturers have a lot on their hands if they need to get closer to these folks. I would strongly recommend heading over to your favorite etailer/retailer and putting your money down for one. Click here to read our review of the "XMark XM-7620 Power Cage". For people who are serious about their lifting and are looking for the best on the market, it doesn’t get better than this. This is undoubtedly the best power rack you can get for money on the market right now. If you are looking for enough places to store a ton of bumper plates, become stronger than your strongest, smashing past records, then just get this fantastic piece of equipment already! There are a few things I can promise you: that you’ll never grow out of these and you can work out reliably with this by your side and you will be stronger than ever. Now down to brass tacks, it has 2x Double plate storage, 4x single plate, monkey chin up bar, fat and skinny pull up bar and finally 6 band pegs. That should round off everything you ever need in a power rack nicely. Yes, it’s a bit more expensive than other racks, but believe me when I say that you get what you put your money down for. 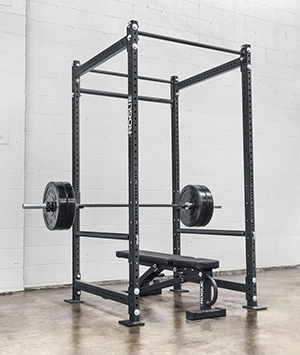 This rack will not break, won’t give up, and won’t tire until it has seen you become stronger. It is the T-800 of the power rack world. I know that you will not regret your purchase. Plus the quality of the materials they use is pretty fantastic. Click here to read our review of the "Rogue R6 Power Cage". If you are looking at budget options, then you would do very little wrong to opt for this. 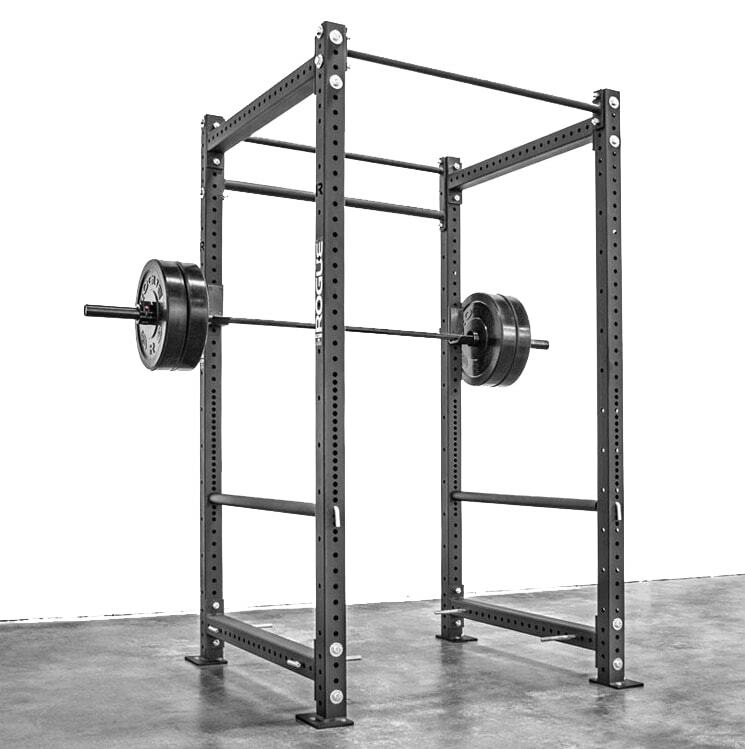 If you are just starting out and not sure if you should invest in a power rack, this can be your ideal companion. For this price, you get a rack that can load up 800lbs of weight! How cool is that? You also get a pull-up bar and catch bar along with plenty of room in case you end up failing on a lift. If you don’t feel right about putting down a lot of cash for other racks, I recommend getting this. It will more than help you get stronger. 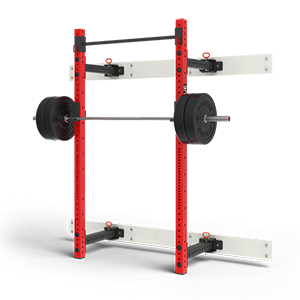 Click here to read our review of the "Atlas Power Rack Squat Deadlift Cage". This is a super huge power rack which comes decked with all the amenities that you are looking for in a power rack. It is built with 12-gauge steel frame measuring 2X2 which gives you durability and strength. It comes with a 3-year warranty on the frame with a 2-year warranty on the cable. Additionally, it also comes with pegs where you can store weights and they are 8 inches long. For safety, it comes with squat bars that are made of solid steel. Once you get it all together, it measures 63.5 X 55 X 85.5 which makes this a really big power rack with plenty of room to maneuver within. Click here to read our review of the "Valor Athletics Inc. BD – 7 Power Rack With Lat Pull". For the best full-body workout, you need to get into a regime that can work all your body parts in tandem. This means that most other equipment fails when it comes to giving you the best apart from a power rack. Of course, once you get started on a power rack regime you will immediately see the results for yourself and you won’t prefer to work on anything else. It is fact that no other gym equipment can get you the kind of results a power rack can. There are several determining factors that help you select what you should actually get for yourself. Since you load up a lot of weight on the rack, it is imperative that you choose the right rack that you are comfortable with and can make working out easy. Do I Have Enough Room for My Power Rack? The thing with power racks is that they require a reasonable amount of room to utilize them to their full extent. This means not just length and width, height also figures into the equation. You also need room on both sides to manipulate the plates around. Believe me when I say that this is not like shopping for a pair of dumbbells. Ceiling height is especially important when your power rack has pull up bars as when you do chin and pull-ups, you need to factor in room above the machine to be comfortable. Do I have enough room for extra accessories? A power rack is the first step, next comes all the additional paraphernalia that comes along with it which you need room for. Remember that you need to make room for different weights and barbells which are going on your power rack. This means Olympic sized barbells, which are pretty long. I suggest you get a feel for them at a local gym or retailer to just come to terms with the length. All this equipment can’t keep chipping away at your wall and there needs to be adequate buffer space between them to be comfortable. If you haven’t planned this correctly, you’ll spend most of your gym time heaving around heavy weights from point to point in your gym without getting actual work done. So create a mental plan about how everything is going to fit in there. When you go to lengths to buy your power rack, make sure you have set aside space for everything that goes with it. Your best bet is to read up on what people are teaming up with a particular brand of power rack to get optimal use out of it. Most manufacturers are coming up with innovative add-ons that drastically increase the number of exercises that can be done on it. You ought to make sure that you are getting all that you want. When it comes to people, sizes vary extremely. One type of power rack can’t be possibly made to work with a woman who is 5’ and a guy who’s above 6. Make sure that if you are getting into a lifting regimen to narrow down a list of people who are going to be using it. While it is okay to opt for a narrower cage depending on your budget, never let it determine the height as it affects the functionality of the machine. On power racks with chin up and pull up bars you need to make sure that your rack does not move around much. This means that you might have to anchor it securely to the floor. Not every power rack comes with this feature so you might do well to check before you decide on the model.For quick information check out our article on the home gym flooring. This is also something that you need to look at beforehand when you are in the market for a power rack. Most expensive power racks have a lot of adjustments that make it more comfortable for you. They come with a ‘safety net’ system that uses pins and other difficult to make adjustments. Check properly before you invest in one. Is A Stabilizer Included As A Part Of Power Rack? There are some types of power racks that come with stabilizers, I really don’t recommend this as I find that it gets in my way more often than it helps me. I’d rather have something I can anchor to the floor. But you can go ahead and take a look at it, but make sure that it either doesn’t get the way of your lifts or it lays flat on the floor. I have to give you the disclaimer first: these will never give you the kind of results that a full-fledged power rack can give you. They are just not equipped for it. With that out of the way, let’s look at some alternatives. Nevertheless, this can give you a lot of advantages when you compare it to not having a power rack at all. This looks like a smaller power rack but devoid of all the safety catches of the real thing. So it isn’t as safe as the power rack and there are no pins. If at all there are pins then they cannot be adjusted. A top of the line squat rack doesn’t even begin to compare with even an average power rack. 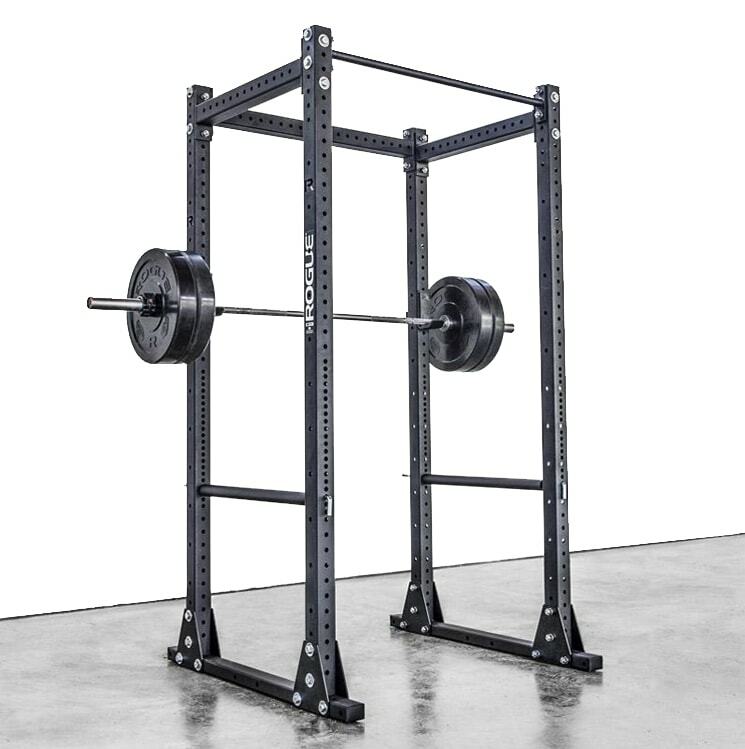 These are smaller than a power rack and so tend to be unstable and have been known to tip over if you aren’t careful about it. They don’t have safety pins and most users rely on sawhorses instead. I do not recommend using this instead of a squat rack. For more information check out our article on the differences between squats vs power racks. This is another smaller variant and can be useful for people who do not have high ceilings. While it serves the purpose of lifting heavy weights well, if you need chin-up bars with your equipment, you need to look elsewhere. Every gym has a smith machine and I’m unable to comprehend why experienced people would still use it. People think that this is a lot safer and effective than even a power rack, but they couldn’t be more wrong. People have reported minimal gains with this machine and there is no point if you are continuing to use it. Generally, when I hear the term half-rack, it instantly reminds me of half-assed. There is no reason for you to NOT go all the way when it comes to power racks because you’ll only be limiting yourself and then there’s the safety factor. 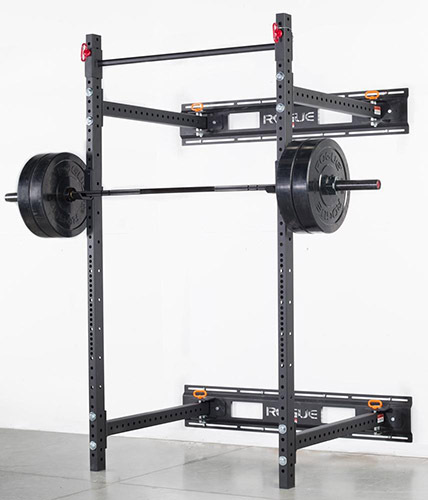 A full-fledged power rack offers you several significant benefits that a half-rack can’t measure up to. This is one of the most important factors when you are lifting really heavy weights. With a full power rack, you have a total safety net with 4 posts supporting you in the likelihood of a mishap. But a half-rack only has 2 posts which means it’s a lot less stable during heavy lifts and will tip over. Since the space you have in a power rack is massive, your exercise motions engage the complete range of movements of your body. Compare this to a power rack, you’ll find that most often it is severely out of its element with regards to compound exercise movements. I’ve tried to give you a rundown of what I feel would be the best fit for you. I also managed to include some alternatives, but I don’t think it would do any justice to the real thing. But if you are constrained for space in your home gym setup, you might have to compromise. Feel free to share your ideas with the community in the comments below.